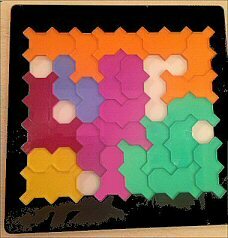 Ochominoes has 24 tiles, with the colors assigned to tiles by how many little squares each dioct piece has attached to it. 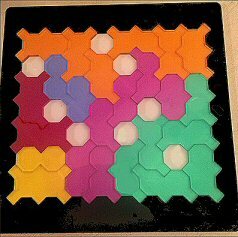 The colors divide into 0, 1, 2, 3, 4, 5 and 6 squares, giving three groups of 2 colors and 3 groups of 6. Separating and grouping of colors is a favorite theme. 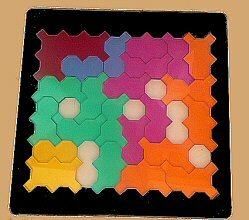 Here are a few color groupings. Finding such solutions is hard! 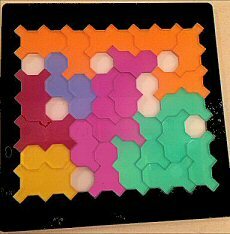 Can you find one where the 8 holes are symmetrically arranged? 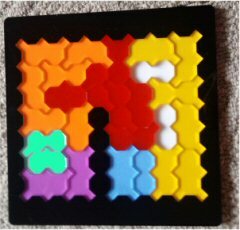 Probably the most challenging solutions to find for Ochominoes is where no two of the same color touch. Here are a few samples wrestled into success by Dan Klarskov. He tells us that each solution took him two or three weeks! 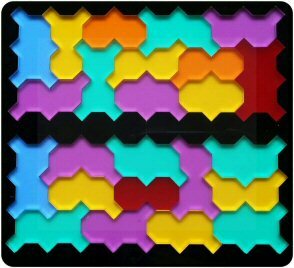 He had found solutions of the rectangle with the black sticks in many different positions without color separation, so he went back to see if the separation solutions were also possible. He conquered all the rectangles shown in the rulebook. Congratulations, Dan! No, we won't show them all here. Let's leave something for our other talented solvers out there, too. 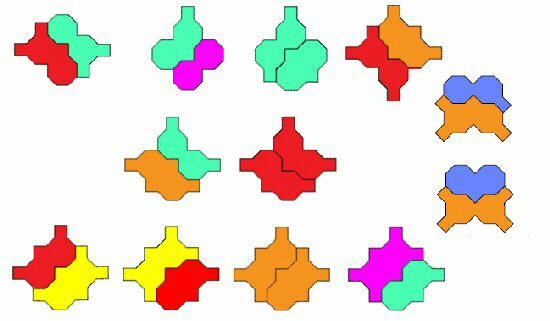 Interestingly, by rearranging the pairings, it's possible to make 7 congruent symmetrical pairs! 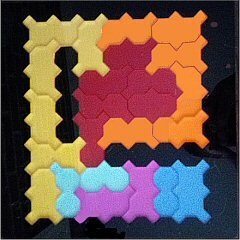 Notice that the second row has two congruent pairs, and the bottom row has four congruent symmetries. The first pair in the first row is rotational. 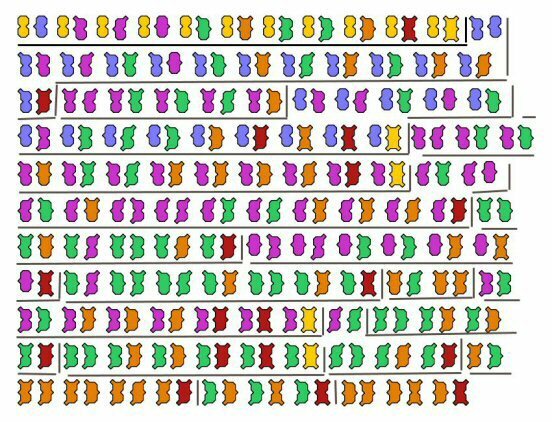 The two pairs on the right side are the non-mixed pairs, and by an unexpected coincidence are congruent as well. 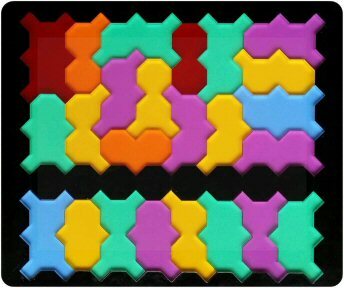 What is also remarkable is that the joint lines of all the mixed pairs are diagonal while their symmetries are vertical. Isn't that strange? 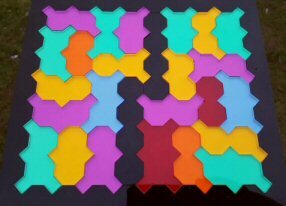 Now we can try to make a series of connected symmetrical pairs. 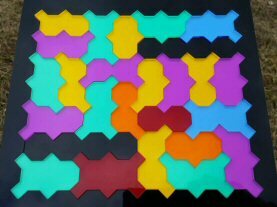 Our best result to date is 23 tiles forming 22 symmetrical pairs, with just one tile left unintegrated. 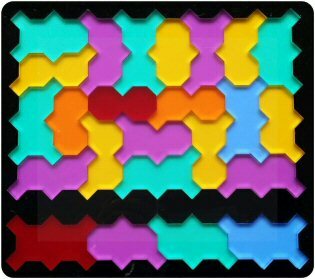 Symmetries can be in any direction: horizontal, vertical, diagonal, and rotational. All four occur in the figure below. Can you spot them all? 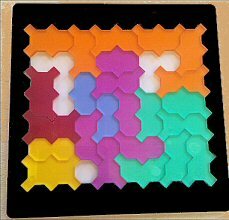 Can you form a 24-piece snake with all adjacent tiles forming a symmetrical shape, or prove it impossible?